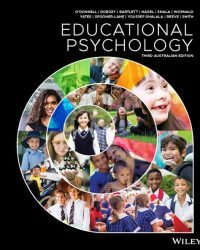 The third Australian edition of Educational Psychology, 3rd Australian Edition (O’Donnell et al.) draws together the pre-eminent academic voices in Australia’s educational psychology landscape to help pre-service teachers develop a practical framework to implement teaching strategies that promote students’ learning, development and potential. This is achieved through jargon-free language, extensive lesson plan analysis and engaging, in-situ media. Available as a full-colour printed textbook with an interactive eBook code, this text enables every student to master concepts and succeed in assessment by taking the roadblocks out of self-study, with features that are designed to ensure you get the most out of what you’re learning. This edition helps inform the ‘prac’ teaching experience with extensive lesson plan analysis and honing the development of skills with thought-provoking questions and activities, and is complemented with videos that allow you to connect the theoretical with the practical, Concept Check questions that tests your comprehension, with instant feedback that provides guidance in where your strengths and weaknesses lie (for further study), as well as learning tools you can use to develop skills you can build on throughout your teaching career, and the opportunity to work between the online (interactive e-text) and offline (print) to cater to how you study best. Refreshed resources like lesson plans that provide pre-service teachers with real examples of what to do when they get into the classroom. Videos to engage, as well as in-situ self-check questions. Strengthened and updated content around ability and disability, digital learning and learning.